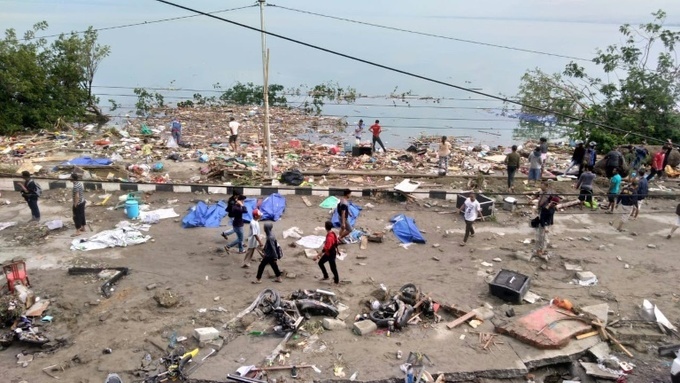 Scores of people were killed when a powerful quake and tsunami struck central Indonesia, as rescuers scrambled to reach the stricken region. Dramatic video footage filmed from the top floor of a parking ramp in Palu, nearly 80 kilometers (50 miles) from the quake's epicentre, showed waves of water bring down several buildings and inundate a large mosque. People living hundreds of kilometres from the epicentre reported feeling the massive shake, hours after a smaller jolt killed at least one person in the same part of the Southeast Asian archipelago. The quake hit just off central Sulawesi at a depth of 10 kilometres just before 6:00 p.m. local time (1100 GMT), the US Geological Survey said. Such shallow quakes tend to be more destructive. Friday's tremor was centred 78 kilometers north of Palu, the capital of Central Sulawesi province, but was felt in the far south of the island in its largest city Makassar and on the neighbouring island of Kalimantan, Indonesia's portion of Borneo island.